It’s really hard to find good-quality and delicious mashed potatoes outside sometimes – they are often the instant kinds, with lots of milk added in it – which made the mashed potatoes overly milky and plain yuck (but I’m picky because I’m not a fan of food with a strong milky taste). You’ve probably seen this mash before here, but I’ve decided that this mash needs a post on its own – it’s that yummy! I use floury potatoes as the base – floury potatoes give the mash the fluffiness that I yearn for in my perfect mash. I add in a carrot as it gives the mash a slight sweetness and makes it more colourful and appealing. Cream/milk and butter are added to make the mash richer and more flavourful – but not a lot to make the mash flood in a layer of oil or milky yuckiness. Parmesan cheese is also freshly grated in to add in a different depth of saltiness before the mash is seasoned well with salt and freshly grounded black pepper. First, peel and cut-up some potatoes and carrot. 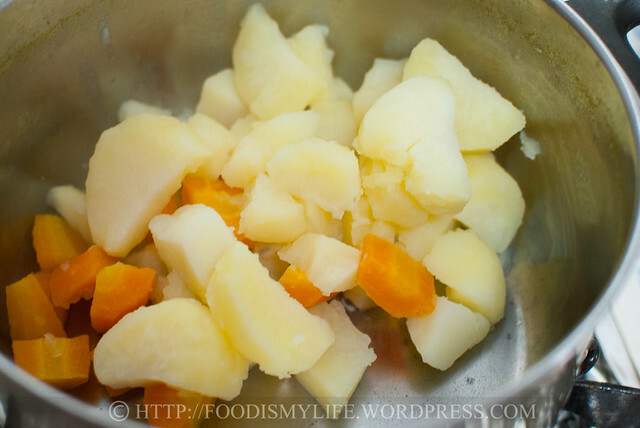 The carrot is cut into smaller pieces than the potatoes as I find that they are harder to mash than potatoes. Add in butter, cream/milk, cheese, salt and freshly ground black pepper. Make sure you stir everything up vigorously with the fork so that everything is fully incorporated. Peel the potatoes and cut into equal size chunks. 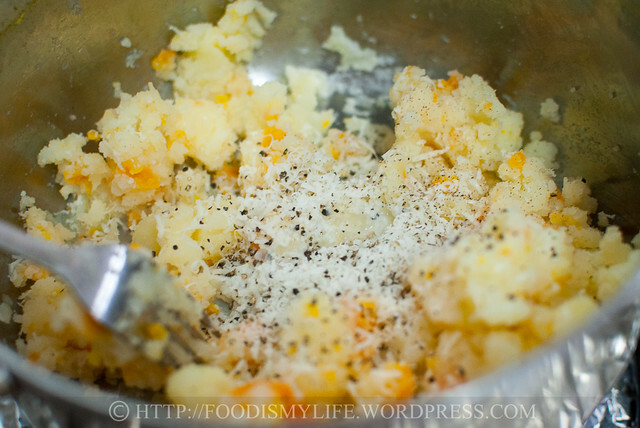 Peel the carrot and them into equal size chunks but smaller than the potatoes. 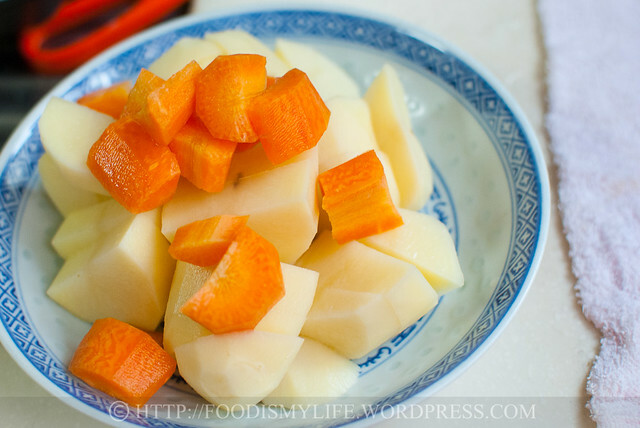 Place the potatoes and carrot in a large pot and cover with water. Add in ½ tablespoon salt, cover and bring it to a boil. Lower the heat to a simmer and cook until the potatoes and carrot are very soft. Drain the potatoes and carrot (discard the water) and pour the potatoes and carrot back into the pot. Turn the heat down to the lowest possible and place the pot on top. Working quickly, mash the potatoes and carrot over low heat. This will allow the excess moisture to evaporate. You can mash 90% and leave 10% in small chunks (personal preference). Once the potatoes and carrot have been mashed, remove from heat and add in butter, cheese, cream/milk and stir until all are mixed together. Season with salt and black pepper, starting with a little at first, and work your way up from there, tasting all the time. Whisk a little more vigorously to ensure all the seasonings are evenly distributed. And carrot makes the mash prettier too 😉 Thanks Michelle! I’m so glad you’re like me and use a little cream. Really not keen on milky mash. 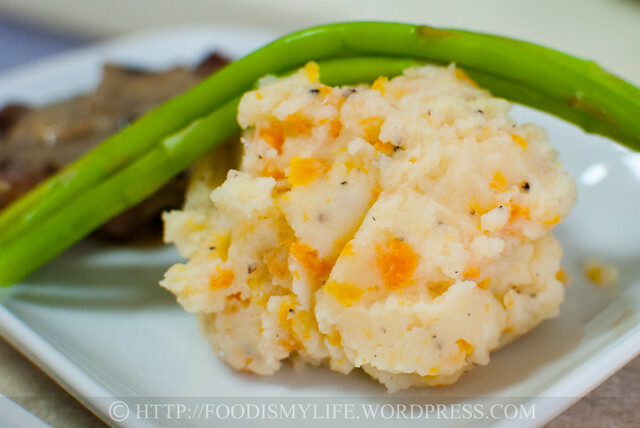 Carrots are a wonderful idea to a fluffy mash! I’ve never seen this before. Looks tasty! Jasline, this looks wonderful! So simple yet totally elegant 🙂 Love it! I love a good mash! A bit of freshly ground nutmeg would also fit nicely. 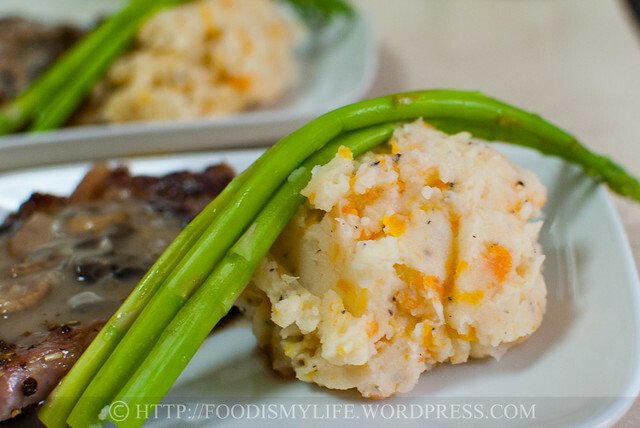 My husband doesn’t like mashed potatoes, so I hardly make it at home.. And it looks so good Jasline..